New strap came today from Watch Gecko. It matches well. Still wearing this morning from overnight at work. 1) What watches are affected? 2) What are the symptoms? I don't think I ever responded to this...Except the seiko, I don't have any of the affected watches anymore. And I agree with you. I still kinda think the magnetic field thing is bunk. But, I haven't found another explanation. And there was a period of about 20 years where I only wore (or even thought about) my Seamaster and wore a fake rolex I've had since I was a kid when it was in for service. So, I haven't experimented much. Affected: Victorinox field watches (~4, all of them), Victorniox diver (don't remember the model, it was around $250 in the early '90s), Seiko Solar SNE393P2 (from 2017). Unaffected (past or present): Omega Seamaster 300m Quartz (2541.80.00; mine is from '97 or '98...I think), Tag Heuer Aquaracer Quarts (90s, not sure the ref number...not even sure it was an aquaracer...it retailed for around $600 in 1997), Casio Promaster Chronograph (citizen promaster 0610-h03299, but that ref number doesn't bring it up anymore), Cheap NYC-Special fake Rolex (had it since I was ~9, not getting rid of it...it's a japanese quartz movement of some unknown make), LumiNox Giant Sea Turtle (0321), Fake Omega Spectre SE (it was a gift) with Miyota something or other automatic, Invicta 8926OB (It's an unbranded seiko automatic movement), Rolex Date Just, LumiNox Navy SEAL. I don't have the Aquaracer or the Navy SEAL watch anymore. The Aquaracer got traded in on the Omega, and the Navy Seal watch was lost a long time ago. I don't wear the date just really at all. It was my mom's and is far too small for me, but I have worn it to make sure it still works. I need to either sell it or send it in for service pretty soon. The Invicta is new, and it usually takes a few days or weeks for it to happen the first time. So, we'll see. But, I can't think of a reason it would affect a Seiko movement if it doesn't affect a Miyota in a fake. Symptoms: They stop. Long before the battery should be dying. So far, it's only happened to quartz watches (either battery or solar). Usually, taking them off and just leaving them alone for a few hours will cause them to start again. Resetting the crown doesn't do anything. The Vic field watche were some of my first, and in addition to exchanging them (mom and I thought they were defective) we had a local watchmaker look at one of them and the vic diver, and there was nothing notceable wrong with them. And he couldn't reproduce the effect in a few days of having them in his shop. The Seiko solar has gotten to the point that it won't run for a full 24-hours, even after sitting under a lamp or in the sunlight for a full day first. I'm pretty sure it's just defective. It's not quite a year old yet, so I probably should look into the warranty. It's not that big of a deal to me...I'm not really in the market for any more quartz watches. The LumiNox makes a great beater, and if I kill it, I'll just get another one or a G-shock. The Omega is about the most accurate thing I've ever seen (it's more accurate than my response time measuring it, the worst it gets is <1.5s/month total variation) and one that I absolutley will never get rid of voluntarily. As the "collection" expands, I'll probably just go mechanical. After seeing so many of them online, I do kind of want a Maratac SR-3 or SR-35 just because they're pretty. I still want a Speedmaster moon watch due to family connections to the Apollo program. I'd feel weird having never owned a Submariner, but I'm honestly not that enthralled by them anymore...and I couldn't tell you why. Until I got my seamaster, it was my grail watch. And, I do like the style a lot...just not at that price (and not the current ceramic bezel ones). 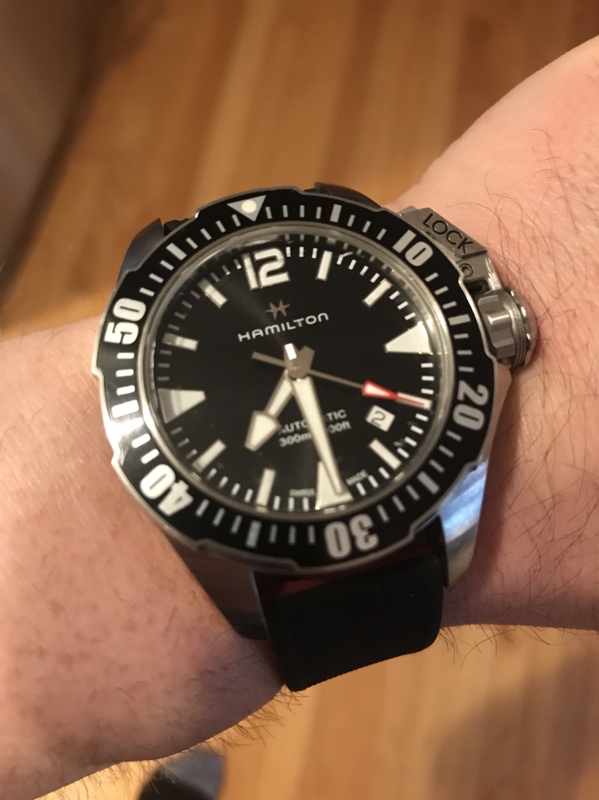 But, I do want an Explorer now that they're available in a 39mm size (I still feel like 36 is too small for me...the Citizen Promaster looks like a child's watch). I really can't explain why...I just think they're beautiful. And unlike the Submariner, I'm not aware of anything else that does that kind of everyday adventure simplicity as well. And, I'll probably buy an automatic version of my 300M eventually just to have one...but they cost more than when they were new (only by a few hundred $s, but still...annoying). I'm thinking a bit about one of the Steinhart GMTs (the white dial "vintage" one), but it's not at all a priority and probably won't happen. Also, I've got a pile of NATO/RAF straps coming in soon. After they come in, I'll post some pics. But, in short, my default is the Omega 300M. I wear the LumiNox to sleep or when I'm training (shooting, jits, etc.). I wear the Citizen when I'm working out or cycling, mostly to time rest periods or sprints. I've been wearing the Invicta this week because I just got it (want to establish a baseline for how it's performing). But outside of "new watch honeymoon" periods, it takes me longer to decide which NATO strap to put the Seamaster on than it does to decide to wear it (been defaulting to a blue ducati stripe or flat gray...but I want to see it on black and the urban gentry valour stripe too). As an owner of 2 Maratacs and a Steinhart, I don't think you'll go wrong if you give them a try. Yeah. Your pics are part of the reason. It looks like countycomm is selling some more SR-35s in a few weeks if I don't want to track down a used one. And as much as I like the super-minimal SR-3, I also really like the maseratti-ish symbol. And apparently at some point they were upgraded to hacking and hand-winding movements. Which is good. Have you measured how accurate yours are? Does anybody have a good source for Nato (preferably the RAF variation with the fabric keeper) straps? I usually get them from cheapestnatostraps.com because the price/quality ratio is good. But, they're outside the US and my last order has been stuck in customs for a week. I'm starting to think they're not going to show up. I'm really looking for the seemingly mythical combination of ducati stripes and RAF keepers.